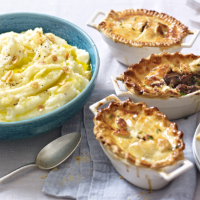 This is sure to be your new favourite way to cook mash. Infused with easy homemade garlic butter, this creamy, moreish side goes so well with your favourite pie, steak or a slow-cooked casserole. 1. Peel and halve (or quarter) the potatoes. Place in a large saucepan of cold water. Cover and bring to the boil. Uncover and simmer for 20 minutes until tender. Drain well, then return to the hot pan to steam dry. 2. Meanwhile, melt the butter and oil together and infuse over a very low heat with the garlic. When the potatoes have steamed dry, remove the garlic with a slotted spoon. 3. Using a masher or ricer, mash the potatoes until smooth. Stir in almost all of the garlic butter, saving a little to serve. Season with a pinch of sea salt and black pepper and stir in the milk. Put in a warmed bowl to serve. Drizzle with the remaining garlic butter and season to taste. Use the same amount of garlic (infuse for a little longer in the butter for more flavour), but double the remaining quantities. Add a further 2 tbsp milk to help mash the potato. This recipe was first published in Tue Dec 23 10:46:00 GMT 2014.